A freak thunderstorm quickly developed off the Pacific coastline near Los Angeles Sunday afternoon and moved onshore at popular Venice Beach in Los Angeles County. Frequent lightning strikes killed one man and injured a dozen others. This may be the only time that a summertime beach lightning fatality has occurred in California history. Lightning strikes across the U.S. on Sunday July 27th. Note the small cluster of blips in southern California and even off the coast of central California. This was due to the summer monsoonal flow sliding further west than is normal. Lightning flash map from VAISALA’s Lightning Detection Network. Although summer thunderstorms are common in the Sierra Nevada and desert southeast regions of California during the Southwest summer ‘monsoon’ season of July-September, it is unusual for the monsoonal flow to track further west and over the coastal portions of the state (as occurred on Monday/July 28). When this does occur, climatology dictates that the thunderstorms that do form (when this situation arises) normally impact the coastal hills and the Antelope Valley region of L.A., not the coastside. Lightning flash density map for the greater Los Angeles region during the monsoon season of July-September. Data from 1987-2000. Map produced by Jamie Meier and Richard Thompson of NWS-Los Ageles from this monograph on the subject. Lightning fatalities by state for the period of 1959-2013. Aside from Alaska, Hawaii, and Washington, California has the lowest per-capita fatality rate due to lightning strikes of any state in the U.S. Map derived from NCDC data. It is interesting to compare the ‘fatalities-by-state’ map with the one above which displays the ‘lightning flash density’ per square mile per year across the U.S. based on the POR of 1997-2010. The reason Florida leads (by far) the number of lightning deaths becomes obvious. Map produced by VAISALA using their proprietary National Lightning Detection Network. On the rare occasion when there is a lightning fatality in California it almost always occurs in the Sierra Nevada where high mountain hiking, camping, and lake fishing are popular summertime pursuits. One of the 33 fatal lightning events that occurred in California since 1959 was that which happened in August 1975 when a group of hikers posed on top of Moro Rock in Sequoia National Park as a thunderstorm developed overhead. Lightning struck these two boys a second after this photograph was snapped by their sister. All were seriously injured and another hiker standing just outside the frame was killed. Photo by Mary McQuilken of her brothers Sean (left) and Michael (right). In spite of yesterday’s fatality, the year 2014 has been close to normal so far as lightning caused fatalities nation-wide to date. Annual lightning fatalities by gender for the period of 2006-2014 (to-date). Over the years lightning deaths have decreased substantially from an average annual toll of over 100 in the 1950s-1980s to fewer than 50 for this current decade. Greater weather awareness and more accurate storm forecasting can account for this decline. Hopefully, this trend will continue into the future. Table from NOAA. The lightning strike was at about 2:20 PM on Sunday afternoon. Interesting blog for a sad reason and with an eerie photo-story from 1975, thank you! We've experienced the hair raising electricity prior to a thunderstorm this spring when walking on a pier in Turkey. First we were laughing, but then we quickly realized that we might be in danger at this exposed place and left in a hurry. For me reading your blog was a worthy closure of a day with serious lightning in Germany and my town as well. Lighthing tracks in Germany today (saved loop). Source. Thanks for the correction! I've amended blog (our local media just ran the story in today's paper and incorrectly stated the time of the storm. My apologies! Thanks Chris for the great blog on lightning..
Chris, does anyone know why the majority are men? Or is it just that they are more likely to be outside, and women are sensible enough to take cover? That was last summer (2013). Given a man and woman of equal height and weight the man will have more muscle mass and thinner skin (fewer layers) while the woman would have more fatty tissue and thicker skin. Skin and fat are much more resistive than muscle tissue. Deep tissue electrical burns are far more likely to be deadly. In other words... Men are better conductors. Thank you Dr. Burt. Your work is appreciated. That is a fascinating fact, one I've never considered or thought of before! I would, however, posit that the primary reason for the gender ratio difference is that more men than women engage in outdoor activities (like mountaineering, fishing, golfing, etc. and thus expose themselves more often to lightning storms. I guess, to test your hypothesis would be to see if, when struck by lightning, more men perish as a result of a direct hit than women do. Thanks for this fascinating concept! Moscow, stuck under the anticyclone today and for a long time to come (including inferno), stuck at 4mm of rain this July. Record in the >150 yrs of the station. Normal precip there is 85mm. Would this be the record driest calendar month there for any month of the year? Fair enough. Working in the power industry and dealing with customers who have limited knowledge of electricity I dumbed down the statement a bit but there is a plethora of information out there. Conductivity data assembled from various studies done over the years. Virtually anything you find is going to be pretty dry reading for most people. The activity argument and being in the right place at the wrong time is going to skew the gender results. Maybe women excercise better judgement and avoid those circumstances. I was just sidestepping that and making most parts of the equation equal. Oddly enough, I'm actually in Kentucky at the moment testing lightning protection systems near Richmond. I've seen enough post-strike damage to know that you could give lightning a perfect path to ground and it will still go wherever it chooses. You're talking about something with enough energy to turn air, which is a fairly good insulator, into ionized plasma to create its own path to ground. ~1,400,000,000 lightning strikes worldwide per year of which 80-90% are cloud to cloud and never reach the ground. Distributed amongst the worlds population makes 25 people for each strike. Only considering incident vs population in regards to area its almost unbelievable that that people should even get struck at all. Those unlucky few tend to be near objects that are good conductors or in places where they themselves are the best conductor. 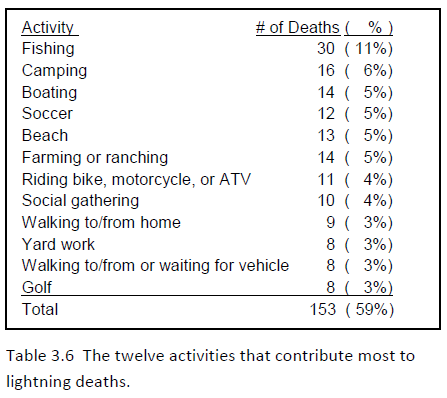 Interesting as to whether it is the first recorded summertime beach lightning death. I recall some summer lightning on the coast in Santa Cruz when I was growing up - mid 1970s or so. Also in San Diego in the 1980s. I will look into this a bit. A little bit of fat and skin tissue won't stop a bolt that has traveled over a mile through air! I think it's obvious that men are either just outside more or are bigger risk takers. You could confirm/refute the latter by looking at deaths from risky activities like sky diving, but I'm too lazy.